Reached via the Mt Bealey Track (commences from Highway 73, just south of the Rough Creek bridge). A good days exercise is to ascend Avalanche Peak, then traverse Lyell Peak to Mt Bealey on their joining ridges. Descend via the Bealey Scree into Rough Creek from Low Bealey (1760m). Ascend Rough Creek to it’s headwaters, taking the true right stream fork. This leads to an ugly scree slope directly under Mt Bealey. Its true-right arm leads to the saddle between High and Low Bealey, while the true-left joins the Lyell-Bealey Ridge at a steep sided saddle. All summits are easily obtained from these points. 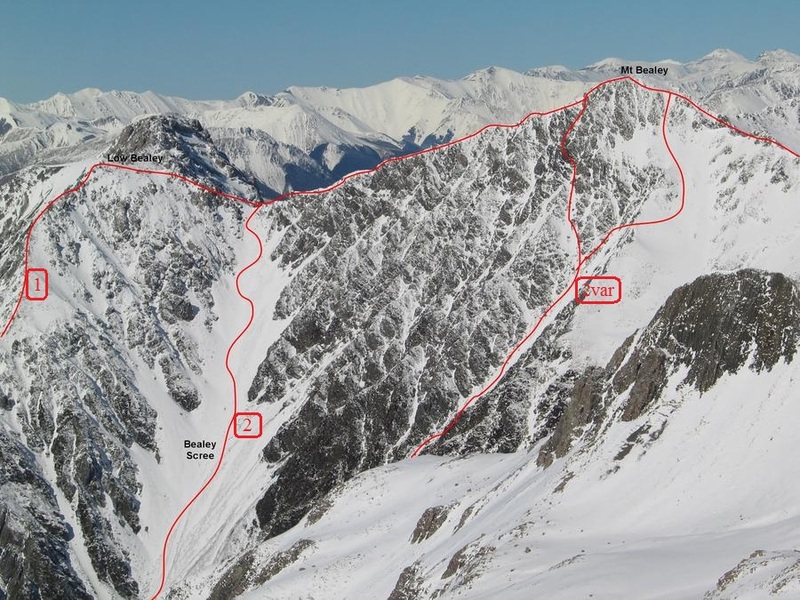 Beware that avalanches can roll for 700m down these routes in winter. The line marked as 1 in the photo differs to 1 in the photo in the guide. The line marked 1 here is wrong. The track actually approaches on the ridge line from the left not up the steep spur shown (which is probably unclimbed).